Imagine you are nine month pregnant, ready to give birth. You feel your contractions start. You are excited and afraid at the same time but mostly you are in pain and you pray that everything will go well. Now imagine it will take you two, three, four hours or longer, to reach the nearest health facility where you can get an assisted delivery. Imagine mountainous terrain and a journey mostly on foot. “For all of my three deliveries, I walked two hours to the main road and then continued by minibus to the hospital. I usually started walking when my contractions started and it took a long time, because I had to sit down every time I had a contraction. But not everyone is as lucky as Mantebaleng. 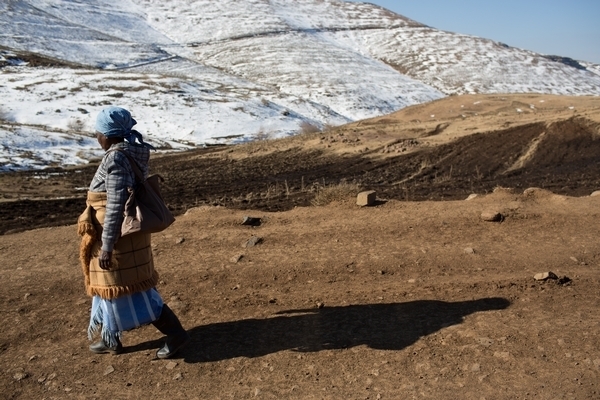 High numbers of people with HIV and poor access to maternity services has lead Lesotho to suffering one of the highest maternal mortality rates in the world at 620 deaths per 100,000 live births – representing about twice the global average. More than 50 per cent of those deaths are attributed to HIV-related complications. The government of Lesotho has set a target to reduce maternal deaths to 300 deaths per 100,000 live births by 2015, and is working on an accelerated action plan to reach the far-off Millennium Development Goal for Maternal Health. Yet, at present, the health situation for many expectant mothers in the small southern African mountain kingdom remains uncertain. Mortality rates in very rural and isolated areas are particularly high. Long distances to the nearest health centre, lack of transport, often impassable terrain in the winter season, as well as user fees charged at major hospitals keep many women from accessing antenatal care, lifesaving HIV treatments as well as services for the prevention of mother to child transmission of HIV. The Médecins Sans Frontières/Doctors Without Borders (MSF) team in Lesotho is supporting rural health facilities to ensure that more women from remote areas have access to antenatal services and safe deliveries. A doctor, a midwife and several nurses are supporting health facilities in 10 different locations across the districts of Roma and Semonkong. At St. Leonard clinic in Semonkong, there is a small maternity ward and a mothers’ waiting lodge, allowing expecting mothers to come there close to their due date, ensuring they will be able to deliver their babies with the assistance of a trained midwife. New mothers may then stay after giving birth until they are ready to return home with their newborn. “I sleep in the waiting lodge with the mothers when I am in Semonkong, and the atmosphere is quite amazing,” says MSF midwife Marleen Dermaut. On average, there are six women at the facility at all times. Since last year, the number of assisted deliveries at St. Leonard almost tripled from seven to 20 deliveries per month. Likely, this is due to a combination of increased health promotion by health centre staff in the area and MSF’s donation of an ambulance. “The ambulance takes women to the hospital in case of emergencies during labour or after delivery. The hospital is still a two-hour drive away from St Leonard, which can be a long time in an emergency situation. In fact, it already happened that a baby was born in the ambulance,” says Dermaut. dditionally to the specific support of maternity services in Lesotho, a team of MSF health promoters is going out into communities regularly to test people for HIV and TB and to improve health education in remote areas. In places with high rates of HIV and TB, this first step is crucial so people understand how to spot the diseases, test for them and be able to start treatment right away if necessary. To reach as many people as possible and to directly involve people living in these areas, MSF trains lay people in communities or “community health workers,” how to test for HIV and when to refer community members to a health facility. “The motivation of many people we work with, be it nurses or community counsellors, and the willingness to make changes definitely makes my work here even more rewarding,” says Dermaut.